A number of specific items or projects are available for sponsorship. Please let us know of your particular interest by contacting Helen Cranston, our Project Manager. The contact details are here. If you choose to sponsor one or more of these items, you will receive a regular progress report. 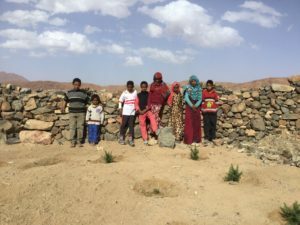 Sponsorship of a garden well restoration will enable an extended Bedouin family to bring their orchard garden back to life so that it supports them with vegetables and crops that can bring in an income. Typically orchard gardens grow olive, almonds, pomegranates, peaches, grapes, figs, walnuts, dates, apples, pears, quince and pistachio nuts. It costs £1300 to restore each well. 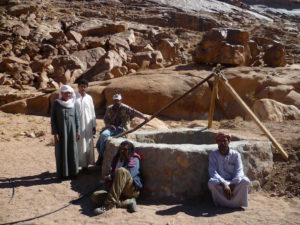 Sponsorship of a community drinking well will enable restoration of a well serving communities of 10 to 25 families. 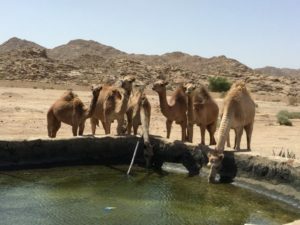 When a well runs dry, due to the declining water table, or is flooded and destroyed, families may have to walk many kilometres to collect water and there will not be sufficient for everyone’s needs. 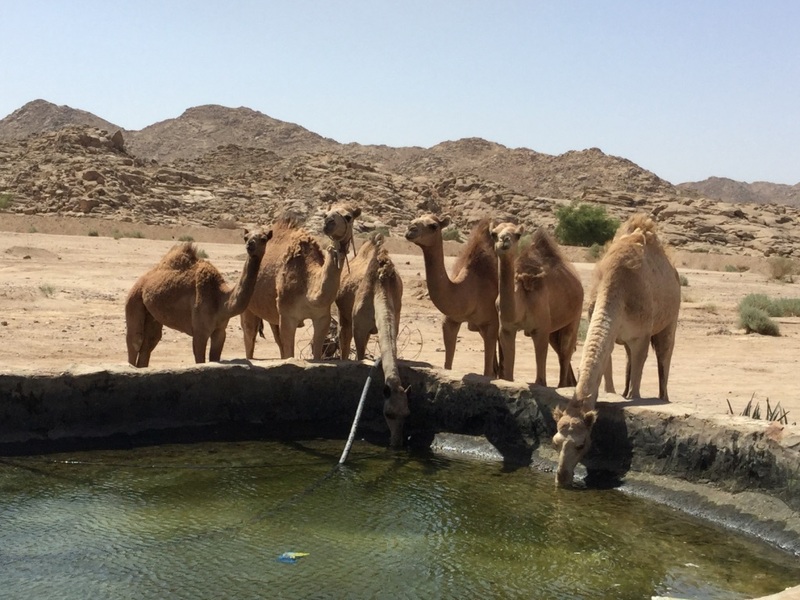 The livestock on which many Bedouin depend, particularly nomadic Bedouin, also need water. It costs £1300 to restore each well. This ongoing project is teaching 6 to 10 Bedouin each year to become beekeepers. 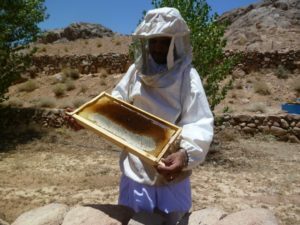 It provides the training and the bees and hives for them to get started. Beekeeping can bring in valuable income to the family, giving them the means to live healthier lives. Mountain honey is much prized in Egypt and supplies are small so honey sells for a good price and many beekeepers can sell their honey even before they have bottled it. The course costs around £5000 to train 6 beekeepers each year. This project has been supported by the Eva Crane Trust since 2016 and by the Didymus CIO for the 2017 to 2018 year. We are extremely grateful to these two generous sponsors. This ongoing project aims to help children who have lost their fathers and who are therefore in very difficult financial circumstances. 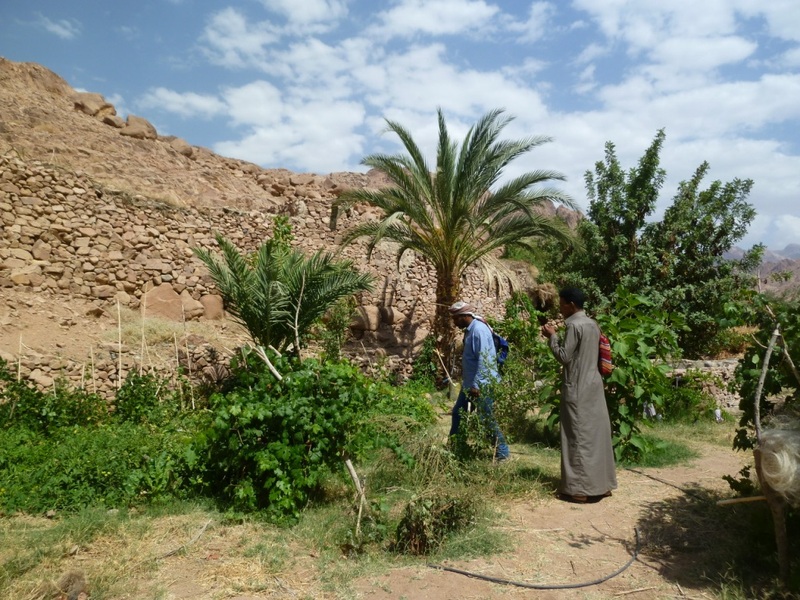 Men are the main breadwinners in Bedouin families and the mortality rates are quite high here, with many men dying of heart disease in their early 50’s. They often leave behind a wife and 6 to 8 children. 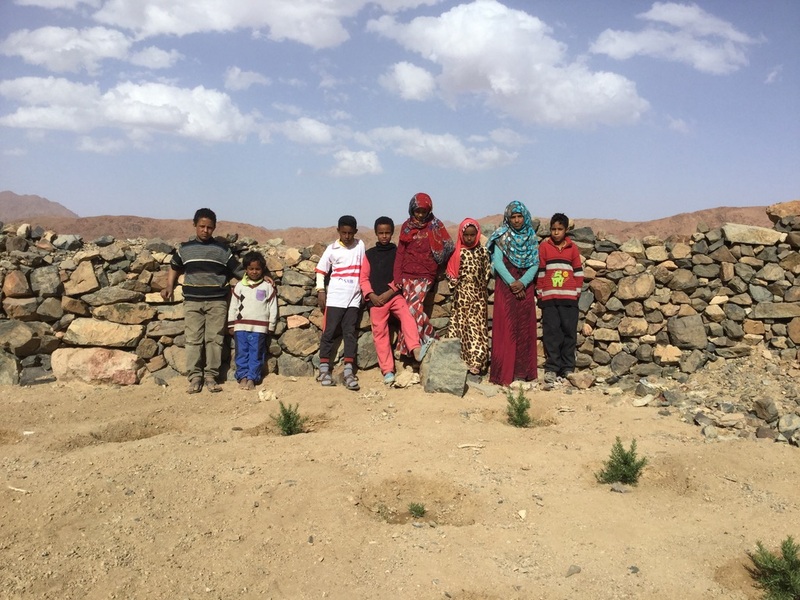 Their relatives and the local community will do what they can to support the family but as everyone is struggling financially, it is difficult for them to help others. The project teaches up to 10 children annually, how to find, grow, dry and package herbs to sell as a means of bringing an income for their family. 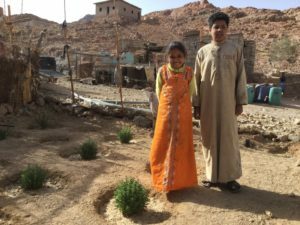 The course runs for one year but the children have to make and then tend their herb gardens for several years to produce crops. The children also learn about the uses of the medicinal and culinary herbs. This project contributes to perpetuating Bedouin heritage and the local knowledge of herb use. It costs around £3000 per annum to train 10 children. This new project is just starting. 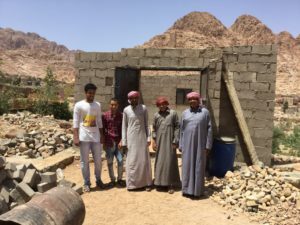 It aims to teach 6 young men (aged between 16 and 20) the trade of carpentry so they can earn a living and support their families in the future. The school building has been completed and mostly equipped. We are asking for contributions to the running costs of this project which we expect to be around £4000 per annum.